After lunch we again went for a panga trip into Santa Cruz. 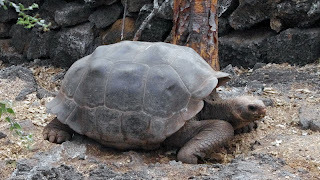 A 30 minutes bus ride brougt us up to the highlands, to meet the giant tortoises in their natural environment. It's interesting to see the difference between vegitationen from the younger islands to the west (approximately 1 million years old) to Santa Cruz at the eastern part of Galapagos which is 5 to 6 million years older. Here was lush vegitation and large trees. We drove about 20 km into the country with agriculture, banana plants and coffee plantations. In this highly fertile areas the giant tortoises (elephant turtles) lives. 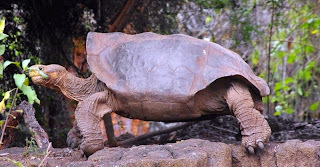 were lots of big tortoises - interesting to see these approximately 100 to 200 kg heavy animals. After a few hours in the highland we drove back to Santa Cruz and the ship. In the evening there were the guides and the captain's farewell reception followed by dinner (we got Galapagos lobster) - and after dinner a glass 'farewell wine' in the discovery lounge. Then down into our cabin to pack suitcases which were placed outside the door before we went to bed. The Highlands of Santa Cruz offer an exuberant vegetation. Large populations of Giant Tortoises are found here. Wild Tortoises roam free crashing through the mist covered guayabillo, pega pega, and grasses of the humid zone. 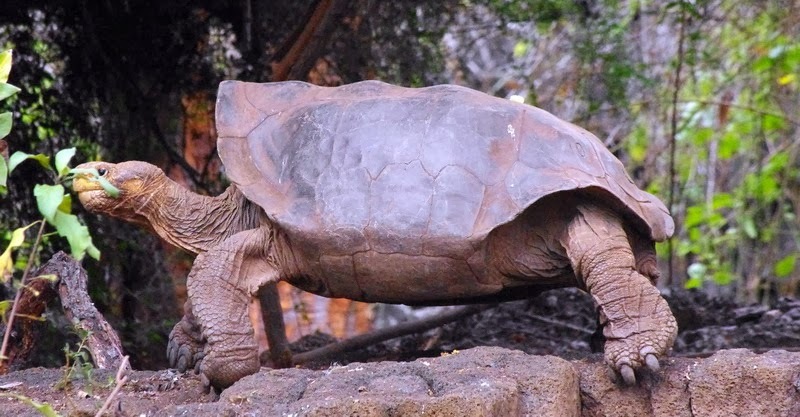 Galapagos tortoise is the world's largest land-dwelling turtle. 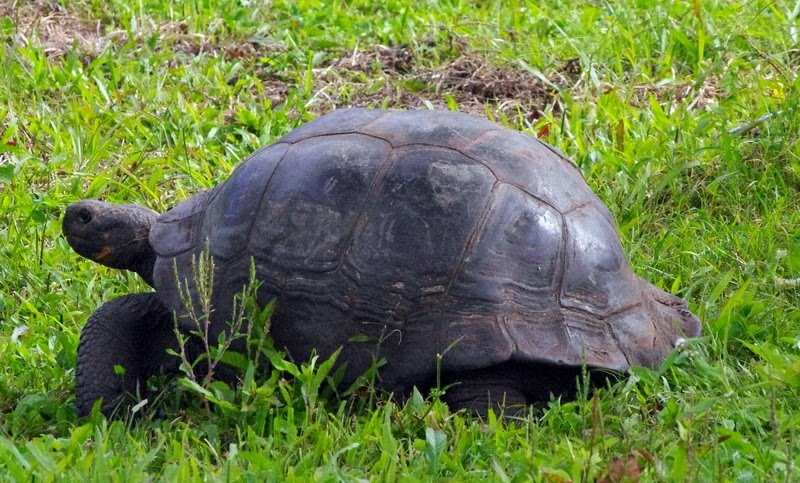 The largest turtles come from the island of Santa Cruz and has a shield with a length of up to 1.3 meters. On the other islands the turtles are a bit less.The big turtles can weigh more than 200 kg .The shield vary not only in size but also in shape. On some islands, turtles shield semicircular, while the other almost in the shape of a saddle , it's completely flat in the middle and curves sharply upward in front. The shell shape is closely related to the places, the turtle lives. If there is plenty of grass that turtles can easily grab the turtles are dome-shelled. But if there is no grass or other low vegetation , the turtle neck stretch up high to grab cactus and shrub leaves. Therefore, these turtles shield shaped like a saddle where the shield front arches upward. It provides plenty of room for the turtle can stretch the neck up high for food. Another example of an animal adapts according to the diet.